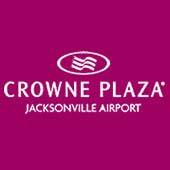 At Crowne Plaza Jacksonville Airport, we we know how to create a productive meeting or an unforgettable event. Whether you're planning a high-tech conference or a wedding celebration, our professional event planners work with you every step of the way. From brainstorming layouts and menus to arranging florists and décor, our Meeting Director ensures that every detail is how you imagined and your guests are inspired. Located just two miles from Jacksonville International Airport, our conference center and hotel offers advanced audiovisual technology that brings your message to life. Enhance your events with flavorful, southern-inspired cuisine and custom catering menus designed by our chefs. Daily budget debriefs assure you stay on target, and our 24/7 airport shuttle and business center keeps everyone productive and on the move. Do you cater to family reunions or military events? Yes, Crowne Plaza Jacksonville Airport offers custom planning for both family reunions and military events, including customized catering menus, decor, room layouts, and entertainment. In addition, a convenient location just five minutes from the JAX International Airport, free shuttle service, and discounted room blocks make planning family, school, and military reunions simple. How many business computers are available for guests? Biscotti’s Internet Cafe, located in the lobby at Crowne Plaza Jacksonville Airport, offers two complimentary computers and a printer for personal and business use. For guests on the hotel's Executive Levels, the Executive Lounge has additional computers and private meeting space. What companies are in Jacksonville, FL? As the largest city in Florida, Jacksonville is home to a number well-known national and international corporations and businesses, including In-Bev/Anheuser Busch, Honeywell/Allied Signal, Coach, Bacardi, and Mercedes. Business travelers will also find Imeson Business Park, Westside Industrial Park, Tradeport Business Park, Blount Island and JaxPort not far from JAX.